Two years ago as part of a bipartisan congressional delegation, I traveled to Barrow, Alaska. That's the northernmost point of the United States. And on my way there, I also traveled through the Yukon Territory in Canada. Traveling over those vast coniferous forests that blanket those harsh unforgiving latitudes, I looked down to see dead trees as far as the eye could reach. These trees are part of an ecosystem formed to survive brutal conditions. But the giant spruce trees of the Yukon, some centuries old, are no match for a relative newcomer: a tiny insect known as the bark beetle. The forests, it turns out, were once protected by cold, cold winters. The beetle could not survive. But warmer temperatures have allowed this invasive species to travel into higher latitudes and wreak unnatural havoc. In once pristine forests, there was devastation. Whole swaths of land-once green-now brown. Of course, this is a story about a place thousands of miles from here, in one of the most remote regions of our planet. But I share it because it's not an isolated experience any longer. It is a part of our story. It is part of Iowa's story and America's story. Alarming climate changes, a stagnant economy, our health weakened, our national security compromised-because of our failure to move to a clean, efficient energy future. It's our story because our dependence on foreign oil threatens our economy. We are more dependent on foreign oil today than we were on 9/11. And one third of our trade deficit is the petroleum we import, as we transfer massive amounts of wealth to undemocratic governments that use those funds to stifle opposition and finance extremism. This is the biggest challenge we have faced in a generation. It is a challenge to our economy, to our security, to our health, and to our planet. And it's time for America to meet it. It is time to get back into the solutions business. And that is what America does better than anybody else. When I am President, we will set three major energy goals for America. One, to reduce greenhouse gas emissions 80 percent from 1990 levels by 2050, the amount necessary to avoid the most dangerous and destructive consequences of climate change. Two, to cut foreign oil imports by two thirds from projected levels by 2030 to move America toward energy independence. And three, to move us from a carbon-based economy to an efficient, green economy by unleashing a wave of private-sector innovation in clean energy and energy efficiency. I believe that will create at least five million good new jobs from clean energy over the next decade. I have proposed a $50 billion Strategic Energy Fund to invest in the clean energy technologies of the future. Here's how we'll pay for it-by ending the tax breaks that oil companies receive to maintain the existingoil dependent economy. We will support the innovative companies, the skilled workers, the creative entrepreneurs and the path-breaking researchers who are driving the next great discovery. Germany, Japan and other countries have surpassed us in the production of solar, wind, geothermal and other vital technologies. We've always been the innovation nation, and it's time for us to lead again. We have lost so much time in the last years. Today America produces between two percent and three percent of our power through renewable sources. Meanwhile, Denmark plans to meet one half of its energy needs with wind by 2025. Last year, Germany produced half of the world's solar electricity. While these countries provide incentives for energy independence, their companies are exporting new technologies around the world, boosting their economies and creating new jobs. In just the last two years, the German economy added 85,000 new jobs in renewable energy. As a point of comparison, since we have almost four times the population they have-they have 82 million, we have a little over 300 million-we could have added some 300,000 good jobs from the same sources if we had been leading the way instead of dragging our feet. As President, to help us reach 25 percent by 2025, I will make the production tax credit for wind and solar permanent. No more guessing what you're going to get as you move forward with your production. America can lead the world's green revolution. Our entrepreneurial capacity, our capital markets, our research institutions and our skilled workforce are unmatched. We are the best in the world-let's start acting like we're the best again. For the Record is an excerpt of a speech by U.S. 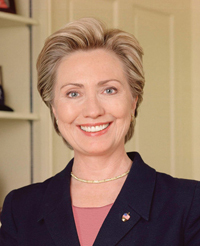 Senator Hillary Clinton to the Renewable Energy Group in Newton, Iowa in November 2007.